With the Orioles looking to sweep the New York Yankees tonight we take a look at Hall of Famer Brooks Robinson. Brooks played his entire 23 year career with the O's. 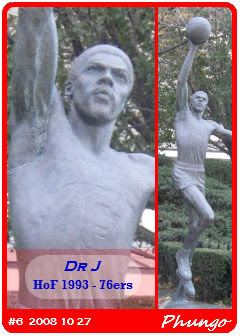 He debuted in 1955, the teams second year in Baltimore. Five of Robinson's Orioles teams made the postseason including the World Championship squads of 1966 and 1970. Robinson was selected for 18 All-Star squads (across 15 different seasons) and won the 1964 AL MVP award. The first ballot Hall of Famer (1983) totalled 2848 hits with 268 Homers, but is perhaps best known for is fielding - He owns 16 Gold Gloves at Third Base, most by any non-pitcher at any position. 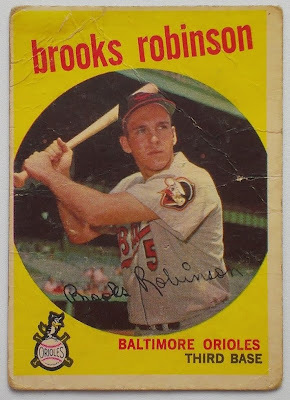 Along with Cal Ripken, Brooks Robinson is the symbol of Baltimore Baseball. It is pretty amazing that the team has two players of such stature who never played for another team. 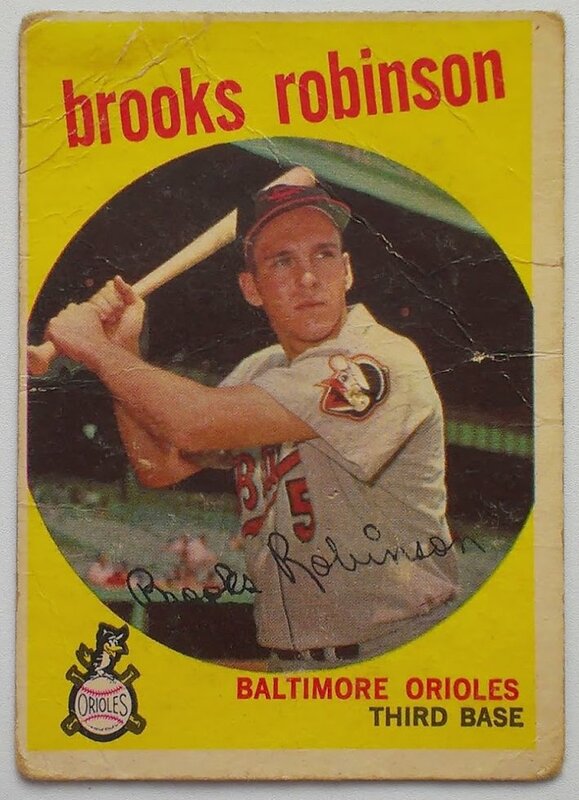 The Brooks Robinson card above which is is in well loved condition went for $5 in September of 2008. His rookie card is 1957 Topps #328. Ebay listings of the RC went as low as $28 for a card described as in "ratty" condition. $70 for also rough condtion. For around $100 cards were in much more acceptable condition. $130 will land you a BVG 3 (VG) condition card. On the High End of the spectrum The Brooks Robinson RC in PSA 8 (NM-MT) condition sold as high as $1,258. The Brooks Robinson 3rd year card 959 Topps #439 featured above had a high auction, PSA MINT 9 condition, conclude at a healthy $636. Ungraded cards came in as low as $3.75 with 9 auctions finishing at $7 or under. Just the Hits: 3 Packs o 2013 Topps Series 2 Hobby - including Case HIts? Busy week at Phungo HQ so cliff notes and pix only - will try and elaborate later. If this was Bucket or Chuck-It these 3 Packs would get a surprise BUCKET LIST IT! 3 Packs of 2013 Topps Series 2, $2/Pack $6 total. Purchased at a card show so no sales tax. I am sick of closers being overzealous upon getting saves. 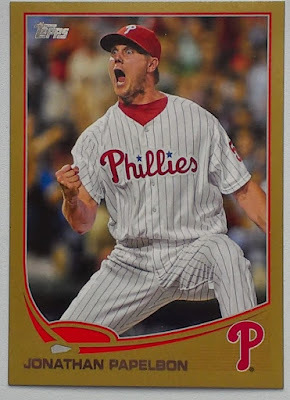 Papelbon is the Phillies guy, so I guess I am ok with this one. I get a Camo Parallel and it is a stinkin Met. 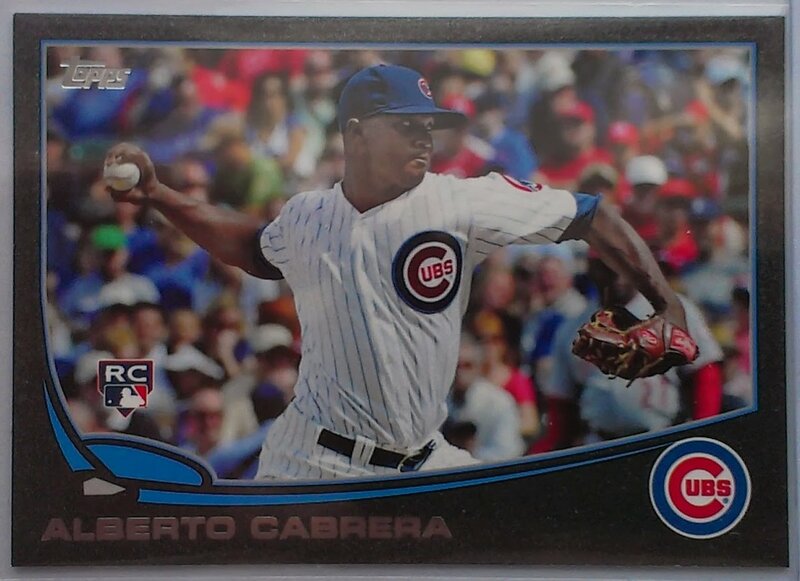 Cabrera was a middle reliever for the Cubs in 2012. I think he is back to starting in their minor league system now. Cool to get a black parallel, even if it is a minor player and looks closer to charcoal in color. Apparently the Black cand Camo Parallels are 1 or 2/ case so those are pretty rare. Team Phungo wins the lottery - well winning in the way that you win when you get 2 of the 6 numbers and you basically get back the cost of ticket. Some Additional Cards that will bear comment at some future time. Posting now for folks that want to see them. There was one other Insert that I picked up - it wasn't anything major but wanted to save it for its own posting. 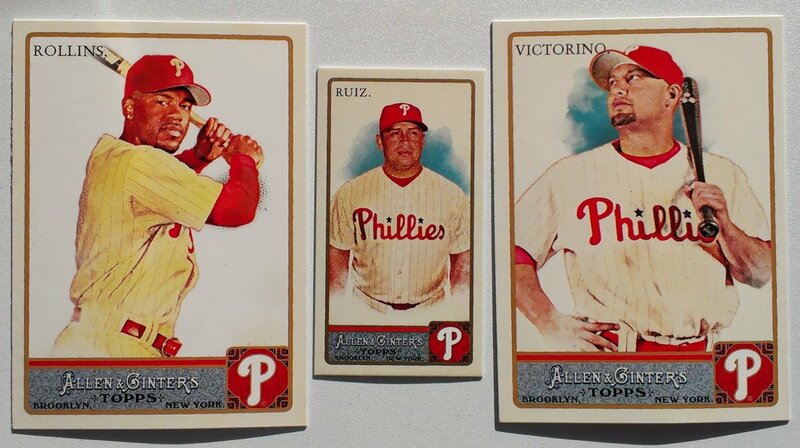 Only one Phillies card but I consider the 3 packs a win just for the rarity of the two parallels that popped up. 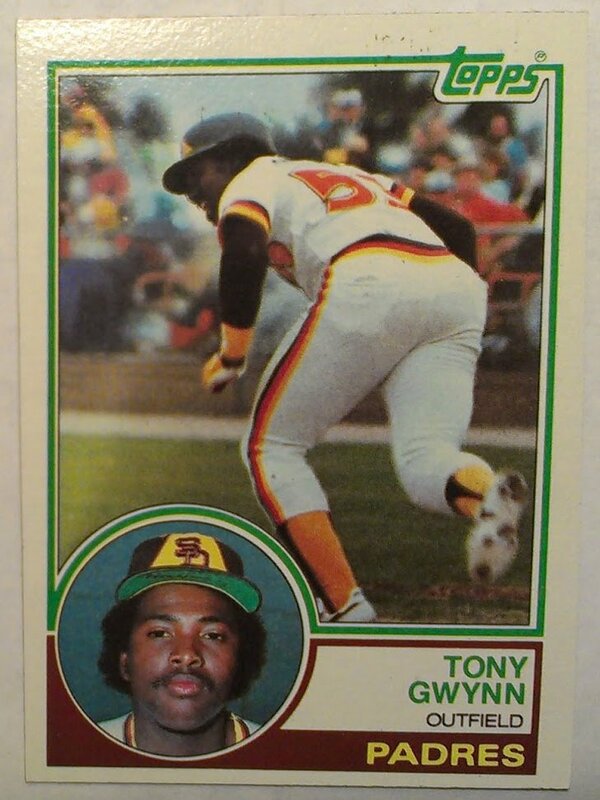 A quick Question, What Jersey Number is Tony Gwynn wearing on this Topps Rookie Card? I did a quick search and found nothing. Does anyone have an early 80s Padres media guide that may has a 40 man roster listing Gwynn? I am a little surprised that with all the information out there, that this remains a mystery. 2013 marks the 30th anniversary of one of my favorite Topps Sets, 1983. I Iike the design and the dual photos. Another bonus is the impressive checklist that includes 3 HoF RCs - Gwynn, Ryne Sandberg, and Wade Boggs. 1983 is near the outset of the MLB awarding multiple trading card licenses and there are actually at least three Gwynn RCs. Plus there is a 1982 TCMA card and the 1983 OPC Gwynn. For me I am a Topps guy and the 1983 #482 card above is the Gwynn Rookie Card. We have covered the career of the first ballot Hall of Famer previously. His career accomplishments are worth reiterating 3141 Hits, 1300+ Runs, 1100+ RBI, 300 SB, 7 batting titles, 15 time all-star. He was also a member of both of the Padres World Series teams, 1984 and 1998. This makes me sick. Tony Gwynn is a first ballot Hall of Famer, His Topps Rookie Card is 30 years old and had recent auctions close as low as $2.10 Shipped! Hell, a year ago Cardboard Connection selected the card as one of the 10 most valuable RCs of the 1980s. 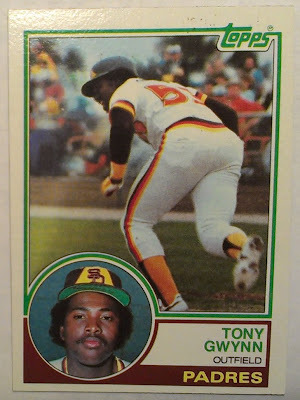 Why the hell would anyone buy a pack of 2013 Topps S2 when for the same price you could have Tony Gwynn's Rookie Card? At least two other auctions ended under $3. The 1983 Donruss #598 came in as low as $3.48 while the 1983 Fleer #360 came in at $3.50 - A graded (PSA 5 EX) version of the Fleer card went for $3.99. All 3 cards could be found multiple times for under $5 and All 3 cards are each currently available BIN under $10. 2013 Phungo Cards #32 Matt Wieters - Banished from Topps, but Phungo has him! Last Week Night Owl Cards had a posting regarding players banished from trading cards for contractual reasons. One of the players he mentioned that is currently in that situation with Topps is Matt Wieters. 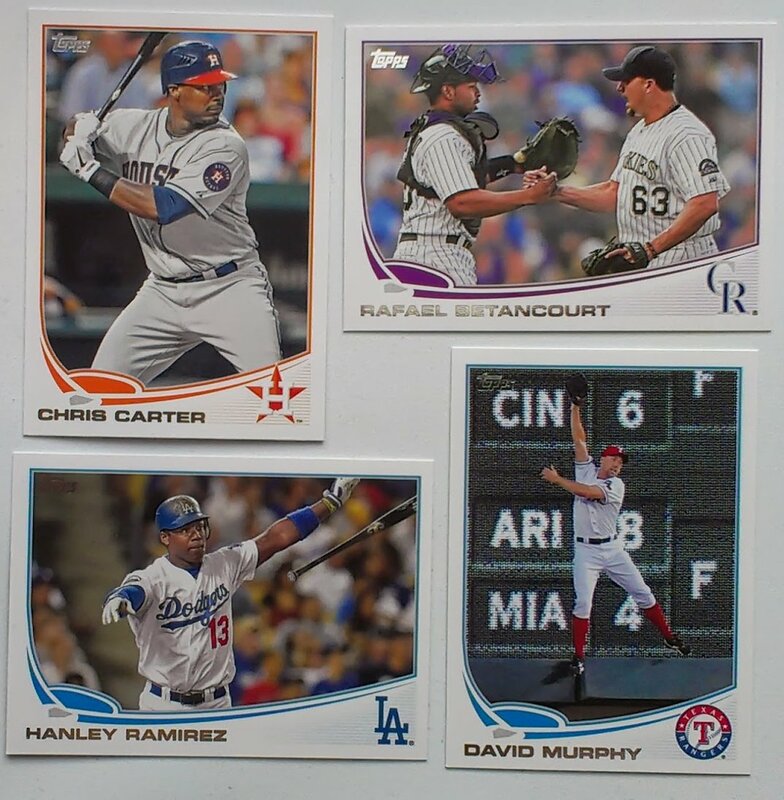 Topps 2013 Series 2 is out this week and once again Matt Wieters is not on the checker. However, if you collect Phungo Cards you do not have a problem. Yes over here at Phungo we don't have to deal with silly legal issues. We are not selling cards, so we don't have to contact MLB or the players union. Just taking pictures and creating cards for our own amusement - so we can come up with a Matt Wieters card or Maury Wills or Barry Bonds or anyone. 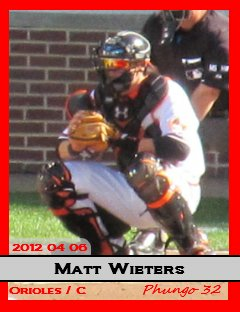 Matt Weiters is card #32 in the 2013 Set. 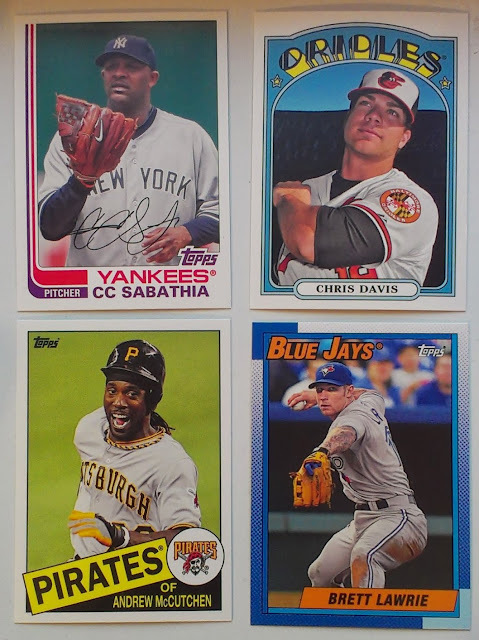 The Card# matches Wieters Uniform number - an Idea that Topps has swiped from the crack crew at Phungo HQ. I know some folks aren't a fan of 2013 Topps numbering, but I have been doing it for years and say why not. I do wish Topps should have stuck to keeping 6 big names on the 00 Hero numbers - there are plenty of players to award the card uni numbers. The Photo on the card was taken on opening day of the 2012 season. Wieters was 0 for 3 that day but did record an RBI on a groundout. I like this shot, I don't sit in the outfield often so rarely get this angle. For a low end point/shoot camera like mine you can only get pix from 400 feet away during day games - there just isn't enough light at night - and I am sure this is using all of the 12x zoom that lil Canon has. 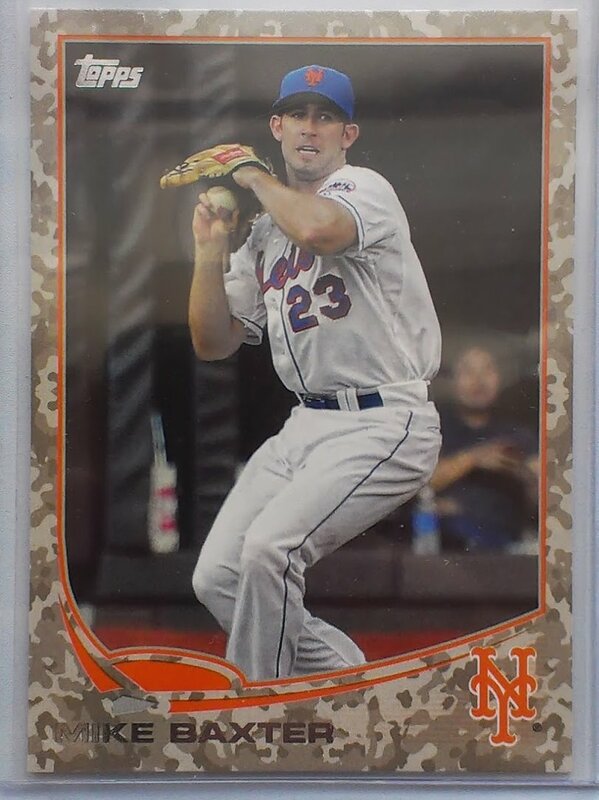 Thankfulluy, the dimensions of a baseball card are very forgiving, since I am only dealing with 2 1/2"x 3 1/2". I can get a shot of Weiters filling the entire frame even though I was nowhere near the subject when taking the photo. Phungo has published at least one other player that has been banished from 2013 Topps. We also have Ichiro. Not sure if this is because of the trade or for another reason, but this is one of the few trading cards you will find of Ichiro in a Yankees uni. 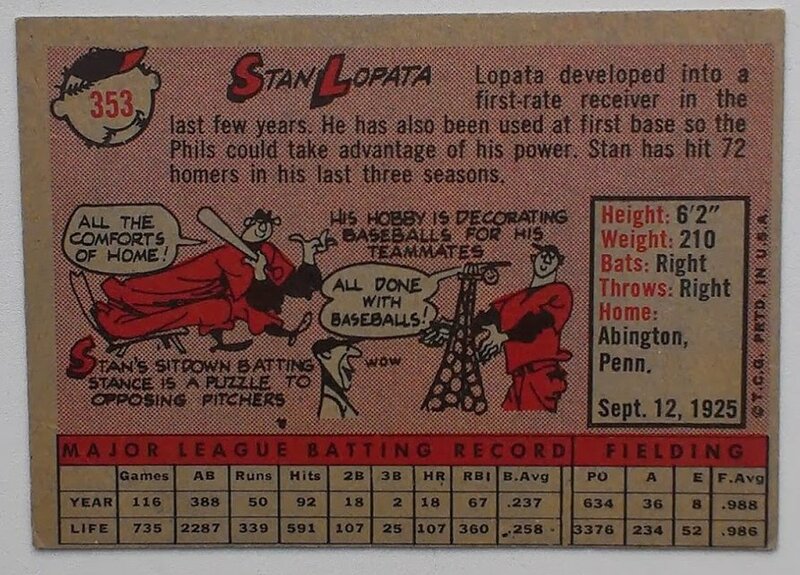 Last night during the Phillies broadcast I found out 1950s era Phillies catcher Stan Lopata has died. Lopata came up with the Phillies in 1948 and spent 11 seasons of his 13 year career with the club. He was a member of the 1950s Whiz Kids team, but only got 1 AB in the series as the back up to Andy Seminick. 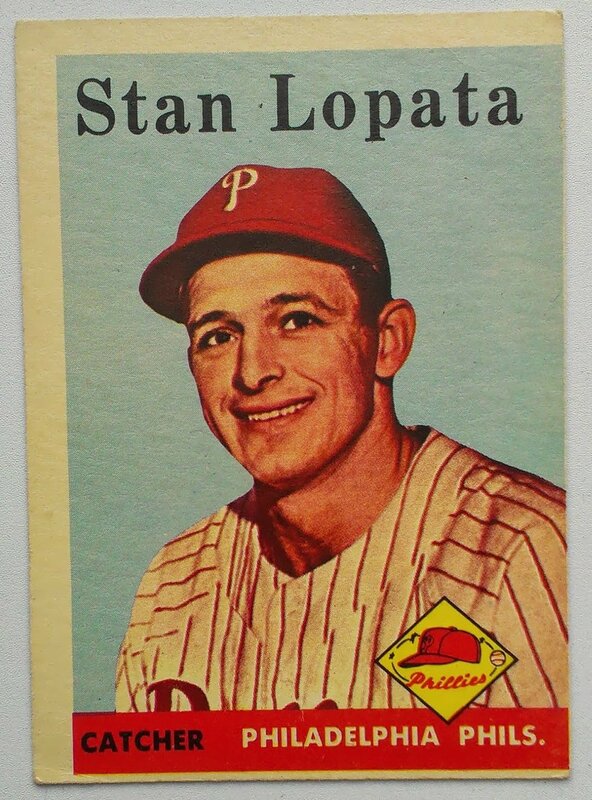 Stan Lopata's best season was 1956 when the two-time all-star hit 32 Homers and ifinished 20th in the MVP voting. I want to direct your attention to the last cartoon. 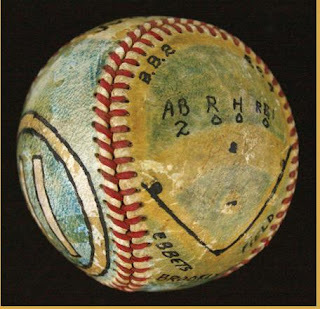 I am not sure how that image correlates to decorating baseballs - it looks like an Eiffel Tower of baseballs. Regardless it is true - he did decorate baseballs. The Above ball is from 1952-07-02. Lopata was 1 for 5 in the game with an RBI single. Robin Roberts won the game versus the Brooklyn Dodgers 4-3. The Dodgers lineup that Roberts defeated featured Jackie Robinson (who homered), Duke Snider, Roy Campanella, and Gil Hodges. The Phils ran out Richie Ashburn batting leadoff and playing center field. Your results may vary but a recent Bargain Blaster was definitely a Winner for team Phungo. The box went for $11.99 + Tax at a local big box store. 3 Phillies cards one of which is a Chooch Mini. The Box is a #Winner right there. I think 2011 is the last year for 1/pack minis in AnG. Starting last year I think the popular minis dropped to 1:2 packs with several insert sets moving to the conventional card size. Nice set of non-baseball minis in ths box. I think I was actually at the Winchester Mystery House when I was a younger. It is kind of creepy cool if your a kid. That was during my first visit to California, and is likely the first time I had Tacos. Salieri is the Character played by F Murray Abraham in Amadeus - 2014 will mark the 30th anniversary of the films release. Abraham is still active at age 73. This card is listed as #222 for the base version. Not sure if this is a box hit or not. According to Baseball-CardPedia there are No Numbered Minis seeded 1:190 packs, but those are supposed to be serialed to /50. This card of course as no serial so I am confused. Any Help Gintermaniacs? 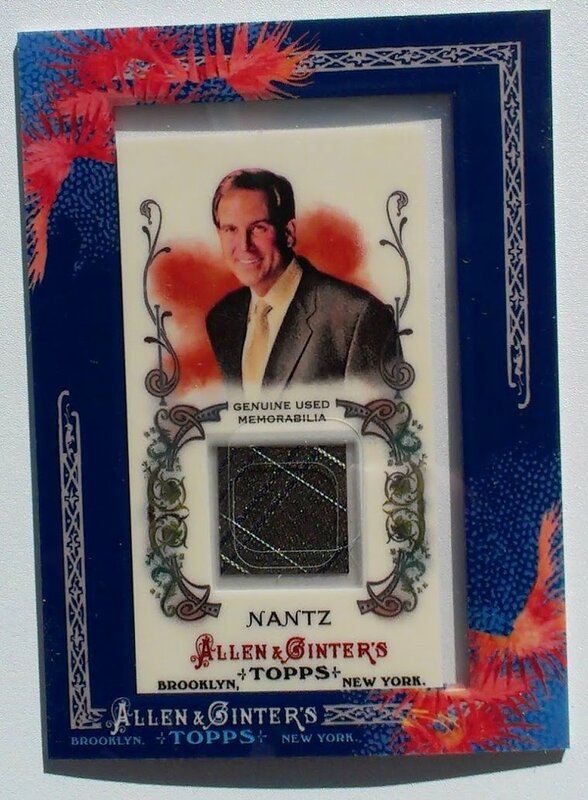 Kind of cool picking up this relic card coinciding with the US Open coming to Merion in nearby Ardmore PA. Also Nantz put together a Father's day related book and that sort of fits the present calendar. Special Crack/Code card with funkcy corners that make it look like somebody wrote on them. I think 2011 might be the first year that AnG had the full size inserts including the Floating Fortress (Le Napoleon) , Minds that Made (Dmitri Mendeleev - Periodic Table), and Ascent of Man. As I noted above 3 Phils including a mini out of a blaster makes the box a W for Team Phungo. Unlike most other folks, I am not a huge fan of AnG. I find the design theme bland, but do enjoy seeing it each year. That being said, I find 2011 Ginter a bit busy designwise. 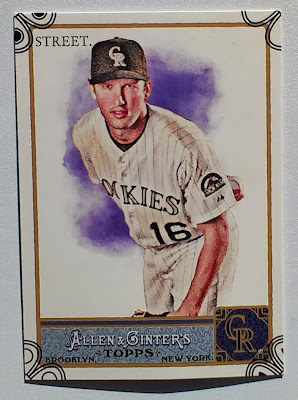 Another oddity is I find that Ginter is insert heavy, which I do find fun, but for whatever reason that doesn't seem to annoy collectors as much as it does for other Topps releases. The New York Mets have listed 2009 #6 overall pick Zack Wheeler as the starter for the 2nd game of Tuesday's double header against the Atlanta Braves. This is exciting news for the Mets, not so much for the Phillies. If Zack Wheeler turns out to be a first round talent, the Mets could potentially have two young aces (Matt Harvey being the other) at the top of their rotation for half a decade or longer. 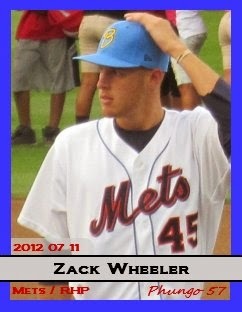 Going into 2013 Zack Wheeler was listed as the #8 and #13 Prospect by MLB.com and Baseball America respectively. His 2013 numbers in the hitter happy PCL (with Las Vegas) are 4-2 W/L with a 3.93 ERA, 1.282 WHIP, with 73Ks in 68 2/3 IPs. Those 68+ innings are spread out over 13 starts, so I would not expect a shutout or even a Gerrit Cole outing. Wheeler has not exceeded 6 innings in his last 5 starts, and has only finished 6 or more four times this season. . The Photo from this Phungo card was taken prior to last years AA All-Star game which was hosted by the Reading Phillies. Unfortunatley Wheeler had pitched in the Futures Game earlier that week and did not get involved in the AA ASG. Phil Niekro won 318 games over a 24 year career. In the history of the game only 15 men have won more. Despite that heady qualification it took Niekro fve elections to get into Cooperstown. 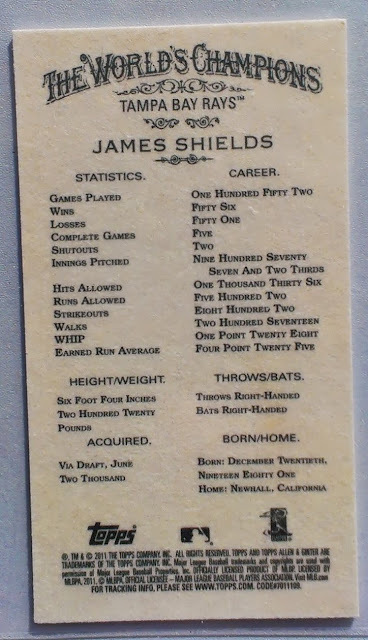 His other noteworthy numbers include 3342 strikeouts (11th all time) and 5404 Innings (4th). Advanced metrics may place Niekro even higher, He ranks 10th all time in Pitching WAR. That puts his Career WAR ahead of first ballot Hall of Famers Steve Carlton, Nolan Ryan and Bob Gibson. Some of this points to Phil Niekro make the Hall as a stat accumulator, but he had standout seasons as well. In 1967 (when he first became a starting pitcher) he led the league with a 1.87 ERA. During a rather impressive 3 year span form 1977-79 Niekro led the League in Starts, Complete Games (65 total for the 3 years), and innings - He also led the league in losses those 3 seasons as well as 1980. Niekro probably deserved to win the Cy Young Award in in 1974, when he lost out to Mike Marshall (freaky 105 relief appearance year) and Andy Messersmith. It's debatable, Messersmith had a better record and more strikeouts, but it turns out Niekro had better WAR, ERA, and ERA+ Numbers. Niekro was also a competent fielder that won 5 gold gloves and made 5 all-star teams. The Niekro family has of course had three major leaguers including Phil's brother Joe and Joe's son Lance. Lance Niekro played four seasons for the Giants whom the Braves are facing tonight. This 66 Topps #28 Card above is Niekro's 3rd card, but it is the first base card where he appears solo. His 1964 Topps #541 RC is shared with Phil Roof, while teammate Clay Carrol appears on 1965 #461 which is also a High Number. 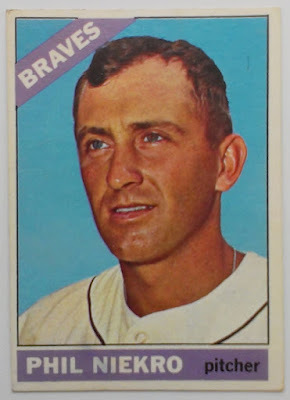 The 1964 Topps #541 RC of Niekro is a high number and correspondingly rare. There was only one recent eBay auction that finished for the car and it was from a lower rater seller. The low BIN for the card is $42. For $110 you can pick up a PSA 7 NM card. Recent ebay auctions for the 1964 and 65 cards concluded as follows(prices include shipping). The last Topps card issued of Niekro during his playing career was 1987 #694 on which he appears in an Indians uniform. The Phillies miserable midwest road trip conludes this weekend in Colorado where they will once again see First Baseman and Drunk Driver Todd Helton. I am not sure if Todd Helton has surpassed Larry Walker as the most noteworthy of the Rockies, but he has past far by him in service time. 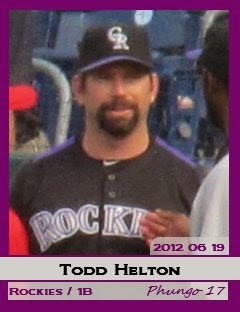 In fact this weekend Helton will pass Walker in Games played for the Rockies by 1000 Games. His career numbers (all with Colorado) stand at 360 Home Runs, 1371 RBIs, 2454 Hits and a Career .319 BA, with an OBP of .417 (#2 Active, #22 All-Time). The five time all-star has won 3 gold gloves and finished 2nd for 1998 Rookie of the Year (Kerry Wood). 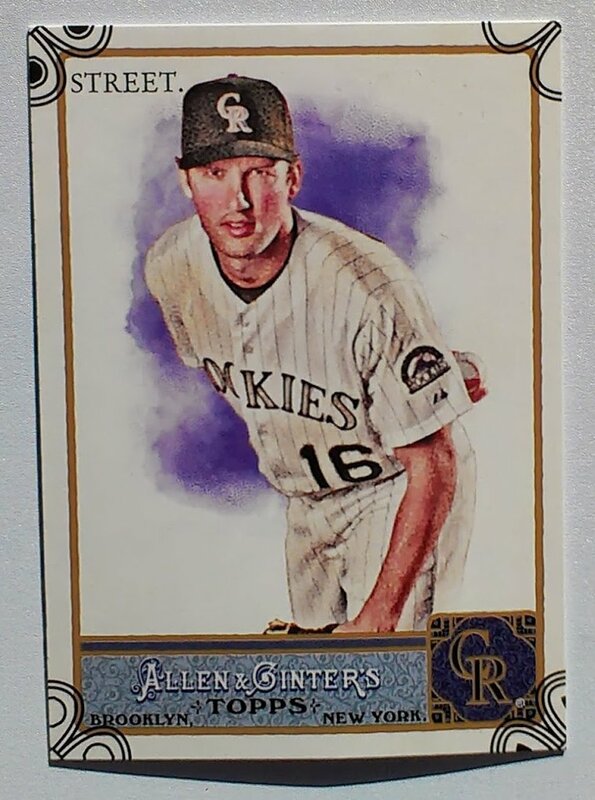 He has been a member of 2 Rockies Playoff Squads including the 2007 NL championship squad that eliminated the Phillies while on thier way to the Series. Unfortunately Helton's borderline Hall of Fame career is crawling to an end. He is merely accumulating numbers onto his peak years now, and looks like he will fall a tad short of milestons like 400 Homers and 3000 Hits. A combination of the near miss and inflated stats from playing his home games at Coors will probably cost him a shot at the hall. Helton is having a mediocre 2013 which is about where he has been the last 4 seasons. He hasn't played more than 130 games since 2009. The one time perenial .300 hitter has slipped to .268 for that period which included only 35 Home Runs. I always give a guy points for mainting a quality career with a single team, but as stated in the title I really can't forgive anyone much less a multi-millionaire for drunnk driving. I am no angel, and may have been a bit rotten in my youth, but I just have no room for drinking and driving. Any good spirit Todd Helton earned he my book was burned this winter. In my opinion DUI convictiions should be handled at least as harshly as PED violations. I have no idea of the status of the Helton case at this point, but I don't think a 50 game suspension for a DUI or related offense is out of line. It is a stand worth taking for the MLB as well as the other major sports. The Phillies are 67 games into the season and once again it is time to admit that they are a sub .500 team. There was a glimmer of hope a week ago when they were beating up on a poor Miami Marlins team, but this weeks road trip through the mediocre midwest Ms Milwaukee and Minnesota showed that the Phillies just can't win consisitently enough. There have been some bright spots notably Domonic Brown, Cliff Lee, and Chase Utley pre-injury. 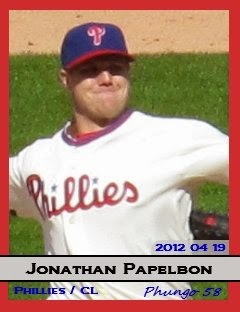 Another player putting together a nice season is Jonathan Papelbon. Cliff Lee got the W last night, ending a 5 game skid for the Phillies. Jonathan Papelbon converted the save, his 12th in twelve attempts. Papelbon is a likely an All-Star candidate for the Phillies, I always think of closers as good candidates for crummy teams, because they tend to have one good stat, on a team that may have nobody with any good numbers. As a team the sub-.500 Phillies really don't deserve a three reps, but Papelbon is likely deserving. Beyond his perfect save rate he has a 1.52 ERA with 22Ks in 23.2 innings - His 4.9 H/9inn is particularly impressive. He also has a Walk rate that is equally low yielding a nice 0.676 WHIP. The Phillies have a bit of a conundrum with Papelbon. He is one of their best performers the last two seasons, but they have not put themselves in postion to use him effectively. Often the offense flat out doesn't score any runs or the bullpen gives up whatever meager lead the Phillies have in the middle innings. This leaves Papelbon out of the mix far too often. Team Phungo made it out for our first Orioles game of the year. It didn't go any better than the other 4 Phillies losses that I have had the pleasure of witnessing this season. The Orioles led 4-2 going into the 7th when reliever Pedro Strop came in and failed miserably. He was unable to strand the two runners Jason Hammel put on, plus he added a few of his own. That was the end of what had otherwise been a decent O's outing. By the end of the inning the Orioles were down 4 and ended up losing 9-5..
McLouth got the O's started off strong, getting a leadoff single in the first and scoring on one of 2 RBI Grounders later in the inning. The game really may have turned on two plays, one of which was McLouth being called out by Joe West on a Stolen Base attempt in the 3rd inning. I thought he was safe as did Buck Showalter. There were some big blows after Conger bounced a single off of Pedro Strop's glove, but this play was pretty pivotal. Had Strop handled the ball or even completely missed the comebacker, I think it is likely the O's would have turned a Double Play which would have gone a long way towards getting out of the inning. Instead no out was recorded and the top of the Angels order came to the plate. Regardless, Pedro Strop really didn't do much else in 1/3 of an inning. He couldn't find the plate and ended up giving up 4 earned. His ERA balooned to 7.58. The AL Home Run leader hit his 21st dinger of 2013 in the 4th inning. The Current AL WAR leader was 2-5 with a double. No miracle catches for Trout who was back starting in center after Peter Bourjos big catch on Tuesday Night. During the defesive replacement phase of the game Bourjos did come into play CF and Trout moved to left. Pujols came a triple short of a cycle. He was a DH on Wednesday and he hasn't played the field much lately. It was very obvious his foot was bothering him and I observed the former MVP talking with JJ Hardy at some point in the game. He appeared to be motioning towards his heal during the discussion. The O's didn't bother holding Pujols had first whenever he reached base. Today it was reported that Cody Eppley has hooked up with the Rochester Red Wings, the AAA Twins Affiliate. Eppley was a decent set up guy for the 2012 Yankees and even pitched in all four games of the ALCS versus the Tigers. Unfortunately he did not fare well in 2 months of AAA ball with the Teams Scranton Wilkes-Barre affiliate this season and was subsequently released. 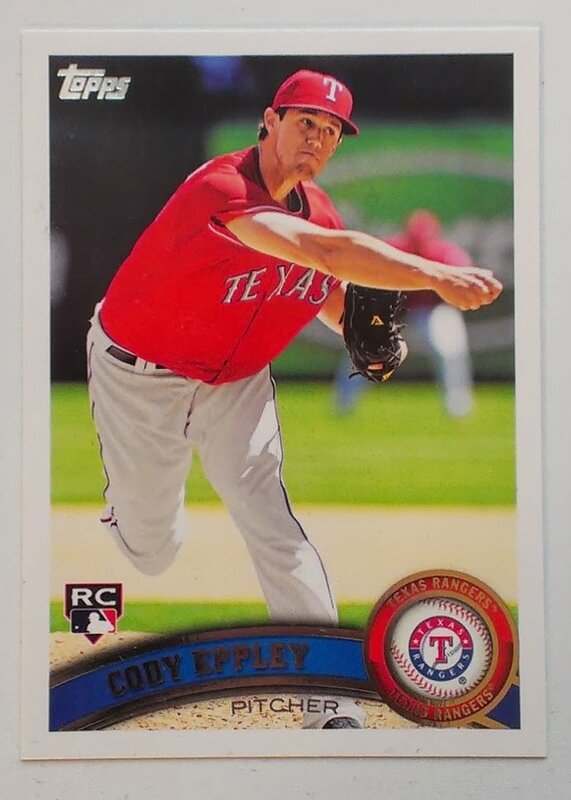 Cody Eppley is one of two players to make the majors out of my high school, and I hope to see him back in the big leagues at some point. Cody's brother Nate was in the A's system but was apparenlty released at the beggining of this season. This week the Phillies are in the Twin Cities and tonight we are taking a look at the career of Hall of Very Good contender Tony Oliva. I liked Tony Oliva when I was a kid. No idea why - cool sounding name, older guy had a .300 average are among my guesses. Probably read a gushing article in Baseball Digest somewhere along the line. One has to wonder how close Oliva's career was to never happening. I don't know a lot about the Cuban revolution, but I would have to think that Tony Oliva had to be among the last players to come out of Cuba in the era - According to Baseball-ref he has minor league experience dating back to 1961. Following a couple of cups of coffee in 62 and 63 Tony Oliva began playing regularly in 1964 when he earned Rookie of the Year honors. In his debut he led the league in Batting Avg (.323) , Runs 109 , Hits 217 Doubles (43) and Total Bases (374). Those numbers were also good enough for 4th in the MVP voting, an award which he would finish runner up for in both 1965 (teammate Zoilo Versailes) and 1970 (Boog Powell). Oliva played his entire 15 year career with the Twins. He represented the team in 8 consecutive All-Star games, starting with his rookie campaign. He led the league in Batting 3 times and hits 5. In 1971 He led the AL in both AVG and slugging. For his career Oliva batted .304 good enough for 154th all time - much of his career was played during a pitching heavy era. He finished just short of some milestone numbers, 1917 Hits and 947 RBIs with 220 Home Runs. Oliva helped the Minnesota reach the playoffs in 3 different seasons, 1965, 69 and 70 But the Twins lost all 3 series. The 1965 World Series the Twins and Dodgers battled 7 games with the Dodgers taking the finale behind a Sandy Koufax 3 Hitter. Oliva did have a Home Run off of Don Drysdale in game 4 of the series. Post playing career Tony Oliva has been involved with the Minnesota Twins in varying roles and still maintains ties to the community. 1970 Topps commons can sometimes be had for a dime, but for a semi-star like Oliva one would likely have to look for the card in a quarter or 3/buck bin. 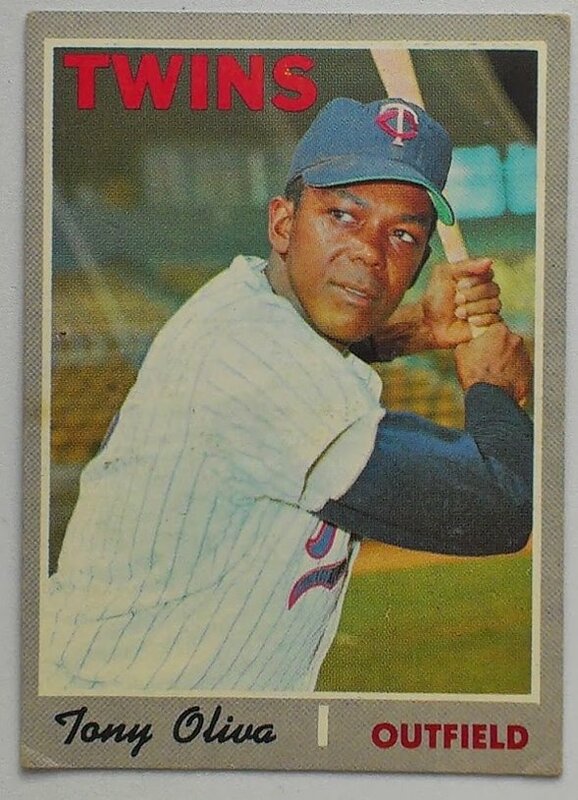 His rookie card is 1963 Topps #228 and Identifies Tony as "Pedro Oliva". The card is shared with Ed Kranepool and two other players. Low eBay for an off condition of this card was $4.04. $8.50 will get you the card in a bit nicer condition. For those of you with a little extra cash laying around a PSA 9 MINT version of this card finished at $1699.00. Yes a buck shy of Seventeen Hundred Dollars!!! PSA 7 NM cards went far cheaper with five auctions ending between $60 and $85 and one being under $50. I could finish the review there but I will post some pix and thoughts. 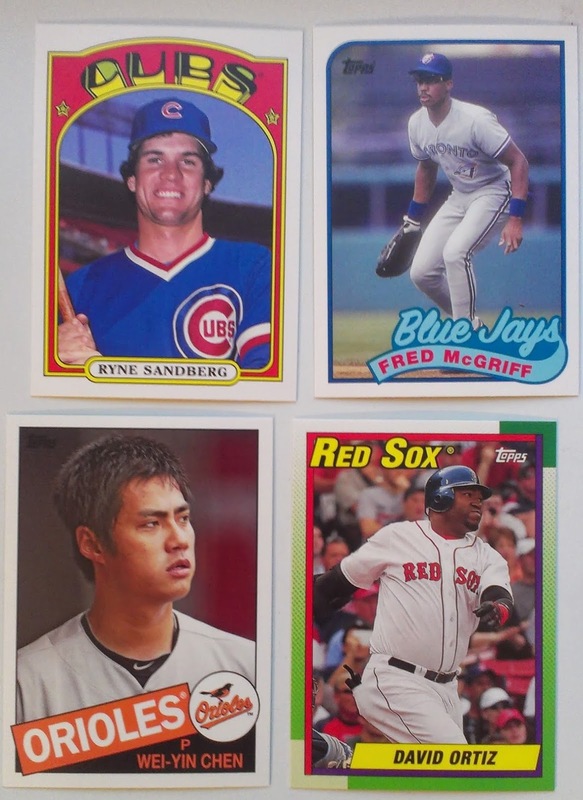 The following cards are from a rack pack of cards purchased at a local big box. $5.99/pack plus local sales Tax (6% in PA) for an 18 card pack. My biggest issue is 2013 Topps Archives is largely comprised of 3 designs I am not fond of, and a fourth that I find to be about average. 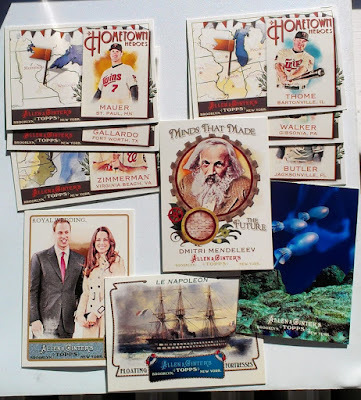 Then there is the issue of Topps Canabalizing their old sets, and finally the whole lottery aspect of opening Archive for the more interesting whacky inserts - I do like the whacky inserts, but they won't tempt me enough to pick up a box. I even dislike the wrapper which got favorable reviews from a couple of sources including The Shlabotnik Report which has a fine column on the derivation of the wrapper. These are the four basic Topps Designs in 2013 Archives. Right off the bat there are too many from the same era - 1985 and 1990 are pretty firnly in the junk wax era and 1982 is pretty close. And 1990 is my least favorite of the Topps canon. Finally, I am in the minority on this one, but 1972 Topps really doesn't do it for me. Hall of Famer Ryne Sandberg is one of the hilights of the pack. The McGriff is a 1:4 Pack short print from the 45 card Fan Favorites hi-number series. Chen has been on the DL for about a month, but was a nice find for the Orioles in 2012, He was a big help to the club to reach the playoffs. David Ortiz is just keeps on chugging looks like he may e adding another fine season to his career. Phungo Review of 2012 Topps Archives. FYI - Despite the 3 Phils I think I passed on getting any future Archives last summer and didn't go for the Hobby Box. Also liked the set selected for 2012 archives much more then 2013. The Sixers have been pretty mediocre lately but they will always have Julius Erving in their History. Tonight(2013/06/10) NBA TV will feature a documentry on the Hall of Famer. The program airs at 9p and 10:30p. For more information click here. What a difference a fortnight makes. You go a abroad for a few weeks and floundering prospect turns into a the most dangerous hitter in the league. 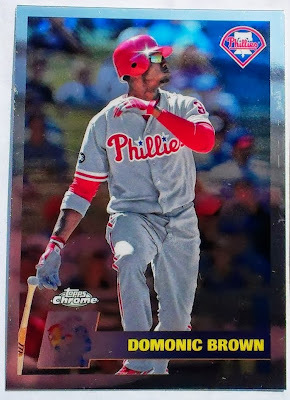 With each passing game the Phillies look more and more like a .500 team, but at least Domonic Brown gives fans a reason to look forward to the future. "he is going to need to hit better than .250 with a .301 OBP for the Phils to succeed"
Well I don't think Dom Brown reads Phungo, but if he does, I would like to think he was inspired. Since that posting on Monday May 13th he has been on fire. He has batted .355 with 13 Homers and 29 RBIs in 24 games. His slugging percentage rose 187 points over the period of 93ABs, pretty good for a man already 132 bats into his season. His 162 game projection for the period is 88 Home Runs and 223 Hits. Oh and 41 Stolen bases as well. 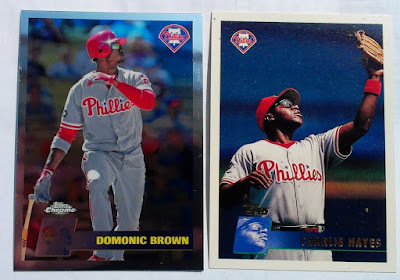 This is a bit odd, one player is batting and the other is in the field but the Dom Brown card on the Left sort of evokes the Charlie Hayes pose on the right. Both players in shades heads tilted in roughly the same direction. Maybe I get a a bit more uppity then I should when Topps is messing up minor details when just making cards of a design they have already produced. But if your to lazy to come up w/ new designs you deserve to be harassed. There are a couple of issues I found with the 1996 redux in 2011 all minor but interesting. First off there is a change that I like - the 2011 variety has the player name in bright yellow. It is much easier to read then the originals. This is a noteworthy difference but a bonus. Now for the differences I attribute to pure laziness on Topps part. 2) B-side: The photo on the flip side of the card is a recycle of the front shot. This wasn't done in 1996. 3) B-side: What is with the home plate color? Check the inset pix next to Heathcliff's name. It is angled slightly forward, dont' see it? check the 'P' on Slocumb's cap - much more italicized on the inset. It is kind of a cool feature gives the whole card just a touch of forward movement. 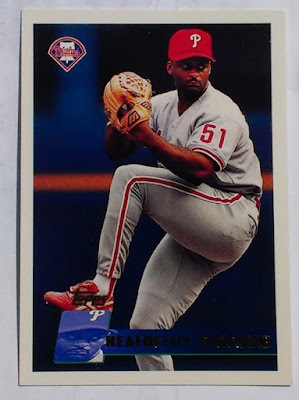 I don't think this happens on every 1996 Topps card but it occurs on a lot of them. 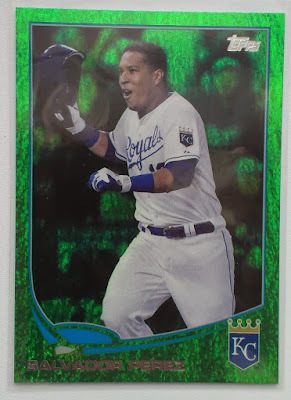 Near as I can tell Topps didn't do this with any Vintage Chrome cards. We can clearly see violations on the both the picture and the Home Plate graphic. Brown's b-side pix matches the photo at the top of the post from the front. 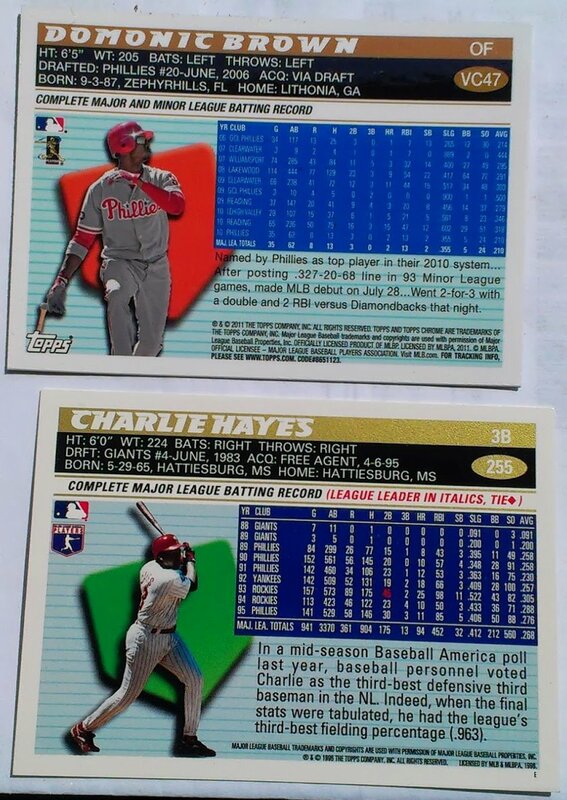 While Charlie Hayes has an new pix on the back. The second issue boggles my mind a bit more. Why the red pate on the Dom Brown card? 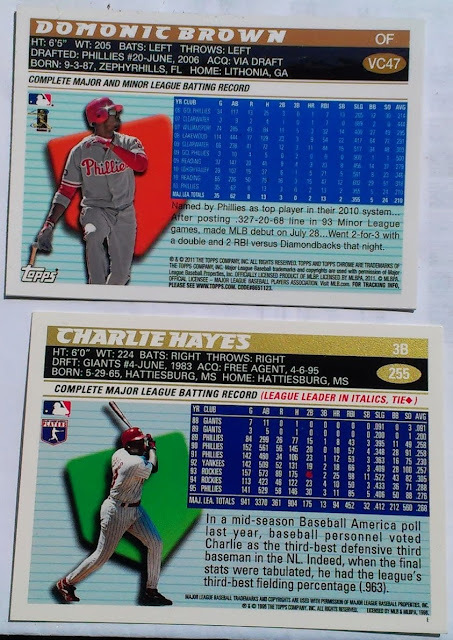 I think in 1996 the Plate graphic came in either green or red, but the Red was reserved for AL players, while NLers like the Phillies are on a green plate. Not sure if this was the intention but the colors match the ones uses for the NL and AL stat books that were available commercially in the 80s and early 90s. I have a small sampling of 2011 VCs and all of them are NL and all of them feature red plates. I don't get it - sheer laziness on Topps part. This weekend the Phillies are visiting Milwaukee to face the Brewers who later this season will be honoring Johnny Logan who played shortstop for Milwaukee's previous tenant the Braves. Like the Phillies who have added many Philadelphia A's to their Wall of Fame the Brewers have honored their baseball past by adding Milwaukee Braves to their Wall. Johnny Logan gets the well deserve honored this season - he has been a leader in the effort to keep the them histoyr of the Braves time in Milwaukee alive. Logan need not enter a teams wall of fame on ambassador credentials alone. He had one of those really decent, if forgotten, careers. His 13 years in the majors included 11 with the Braves in both Boston and Milwaukee and the balance with the Pirates. He was the starting shortstop on two Braves World Series teams including the 1957 squad which won the World Championship in 7 games. Between 55 and 59 Logan made 5 All-Star appearances. His best year was probably 1955 when he led the league in Games Played and Doubles while batting .297 (116 OPS+, 6.0 WAR ranked 6th in the NL). He also stacked up well defensively, leading the NL in assists at short 4 times during the 1950s. He has a very interesting SABR Bio that is worth a look if you have some time. Logan lost 2 minor league seasons to the service during WWII, but he also attributes that time to helping him learn the fundamentals of the game while playing for the Army team based out of Camp Wheeler Georgia. Last year the Brewers honored broadcaster Bob Uecker with a statue near the stadium - briefly mentioned in this post last year. 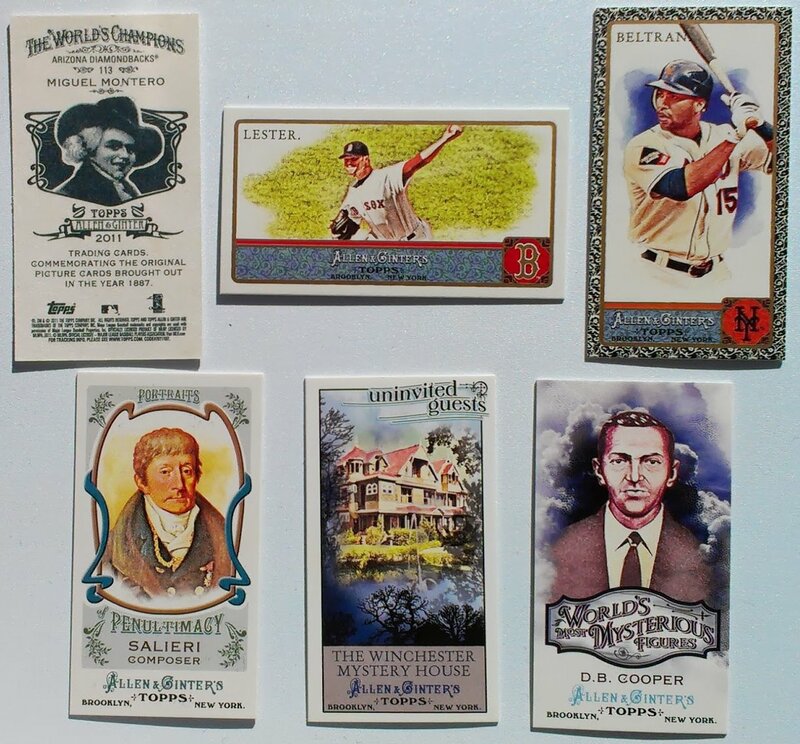 CommishBob covered the 59 Topps Johnny Logan card on his Set blog back in 2011. I picked up the Johnny Logan card featured above as part of an ebay lot in April of 2008. The card went for about 40 cents - it is in ok condition, couple of creases the number 16 (Logans Uni # w/ the Bucos) in pen on the front and a small 'x' written on the back. At larger card shows Topps 1959 commons often be found for 50 cents. 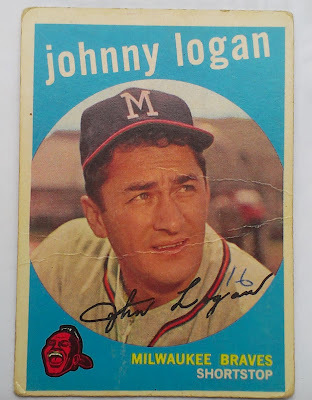 The Topps Rookie Card of Johnny Logan is #158 the 1953 Set. It has sold recently for a low of $15 (there was an off condition card for $5.75 from a questionable seller). The high for the card was $42.50 for a card graded NM by somebody known as Starx Cards, whomever they are. The 1953 Topps Logan card lists his name as John rather than Johnny and it is the only card where he is a member of the Boston Braves. He has a Topps card for every year from 53-63 excluding 1955. In 55 Bowman had a Johnny Logan offering (#180). His last Braves card is in 61, the final two cards are with the Pirates. Tonight the Phillies have the 16th pick in the 2013 MLB entry draft. Thiis is the highest pick the Phils have had since picking Gavin Floyd at #4 in 2001. The Phils have had a number of recent picks in the #16 neighborhood including Cole Hamels (#17, 2002), Chase Utley (#15, 2000) and 4A pitcher Joe Savery (#19, 2007). They have also picked jettisoned pitchers Kyle Drabek (#18, 2006) and Brett Myers (#12, 1999) in nearby spots. This Phillies have only ever specifically picked in the #16 spot once during the June Draft. That pick was a High School Catcher out of Virginia named Trey McCall in 1985. Today we turn back the clock 27 years and take a look into that pick and the rest of the 1985 MLB Draft. Unfortunately McCall never had first round impact as a player. He spent five seasons in the Philllies system reaching as high as single A Clearwater in 1989. The remainder of the Phillies 1985 draft yielded 5 players that reached the majors, including pitchers Bruce Ruffin (Rd 2/34th overall), Jason Grimsley (Rd 10), and Wally Ritchie(Rd 4). The best player taken in the first round of the 1985 draft was Barry Bonds (#6 Pirates), The round also yielded HoF Shortstop Barry Larkin (#4 Reds). The best first round pick after McCall was Bond's PED brethern Rafael Palmiero (#22 Cubs) other notables include Brian McRae (#17 Royals) Joe McGrane (#18 Cardinals) Gregg Jefferies (#20 Mets). The first overall pick of the 1985 draft was BJ Surhoff by the Orioles followed by Will Clark to the Giants and Bobby Witt (Rangers). Other 1985 round 1 notables are Pete Incaviglia (#8 Expos as a 3B!!!) Walt Weiss (#11 A's) Tommy Greene (#14 Braves) Joey Cora (#23 Padres). Chris Gwynn was drafted #10 overall - 48 picks prior to his Hall of Fame brother Tony's postion in the 1981 draft. McCall was the 4th higjest among the High School Prospects taken in the first round, only one of which made the major leagues (Tommy Greene). Among Catchers McCall was the 2nd taken behind Kurt Brown (#2 White Sox) who also didn't make the majors. Today the former professional baseball catcher finds himself at the helm of the Emory & Henry Wasps of the Old Dominion Athletcis Conference (ODAC - NCAA D3). McCall has been with the Wasps since 2005, This season the Wasps, based out of Emory Virginia, had a tough 9-27 season finishing last in the ODAC. Trey McCall also peforms Assistant AD duties Emory and Henry and he will spend the summer of 2013 as an assistant coach with the Cotuit Kettleers in the prestigous Cape Cod League. Earlier today Phillies Site Phielder's Choice took an in depth look at the history of the MLB draft 16th pick. You may have noticed there hasn't been a post here in a few weeks, that is because Team Phungo has been abroad travelling across the United Kingdom. We were fortunate enoughed to be invited to a friends Wedding in a castle outside the Scottish town of Stirling. It was a great idea and a good time was had by all involved. Inverness - Bucket - cool little down on northern tip of Loch Ness, appears to have a vibrant night life. Loch Ness - Bucket - I don't know any of my European Geography, but this lake is huge, there is also a significant cool factor in checking out the home of an iconic real or mythical creature. Nessie Shops - Chuck-It - stuff for the amatuer tourist. Highland Club, Ft Augustus - Bucket - Monastary on the bottom side of the lake. Rented out a few suites with friends and had a great time. Manchester - Bucket - great town. I have no concept of how bit Manchester is, but it had entertainment value that rivals a town the size of Philadelphia. Destination Wedding Europe - BUCKET and BOTTLE IT - if you have the resources and are fortunate enough to get invited to a Dstination Wedding, I strongly urge you to consider it. GPS in the UK - Bucket - If your driving I highly recomend it, and check out how your insurance works when travelling abroad. Citizen M Hotel - Bucket - rooms may seem a bit tight to some but staying in these newer Eurostyle hotels was pretty cool. Sundays in Europe - Chuck It - I can never figure out what places are going to be open on a Sunday when travelling abroad. Most of this is ok, except figuring out the whole eating thing. US Airways - Meh - Didn't have an issue this time through, but they how me for to many shoddy experiences in the past - they were adequate. Jet Lag - Bucket - Parts of Scotland are as far north as Alaska - the sunset goes on forever and twilight remains till near 11 pm. This is 40 - Bucket - good enough or an inflight movie - and cameos Philadelphia Flyer Scottie Hartnall. Spies Lies and Naked Thighs - Meh - Late 80s Harry Anderson/Ed Begley Jr Vehicle - this was pretty bad and we didn't make it thru the whole movie but it may have some unintentional humour. Trading Cards - Unknown - but I got a few packs of stickers (UEFA I think) and we will be checking them out. Hope to get some more pix up and more details on the above eventually. Had a great time abroad, but am glad to be back home.